Discussion in 'Android Apps & Games' started by codesplice, Jan 15, 2015. 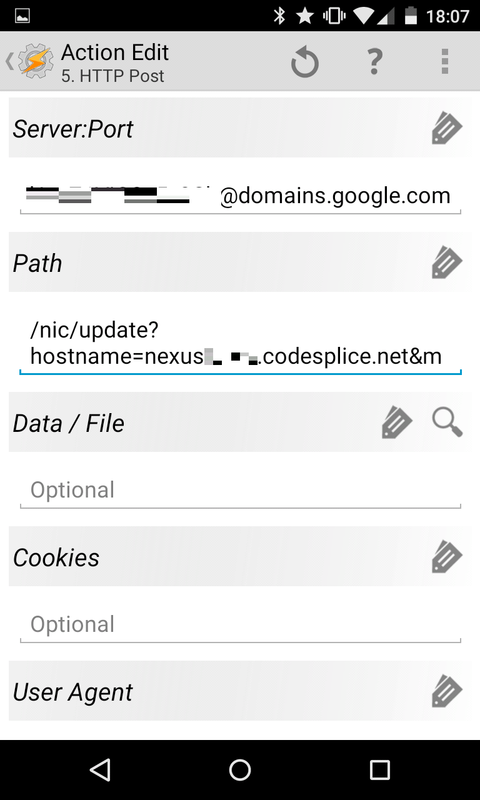 I whipped up a profile that I'm fairly pleased with... since Google Domains just added dynamic DNS support (as well as an API for updating the records), I created a Tasker profile to automatically update a DynDNS record for my phone whenever it's connected to Wifi. It's not a particularly useful profile (unless you plan on hosting a website on your phone? I'm not going to judge) but it was a fun challenge to put together. Besides, it's been a while since I've whipped up a profile from scratch. I also figured this was a good time to start using that domain name I purchased for something - a wild blog post appears! The name given to the profile. This profile will be a "fire-and-forget" sort of thing, so I don't want an ongoing notification when it's active. I'm going to attempt to update DynDNS when connected to Wifi. Name of the Enter (and only) Task. Wait 5 seconds after connecting to Wifi (to allow time to receive local DHCP IP and establish Internet connection). Connect to a dead-simple service for resolving the phone's public-facing IP. 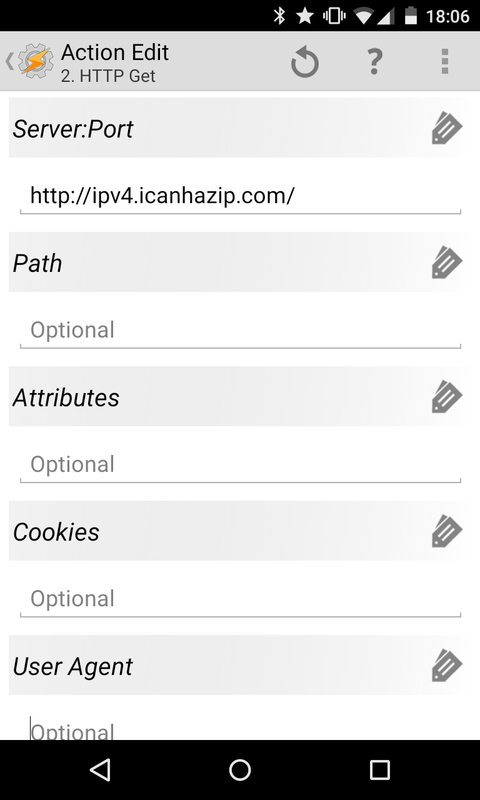 icanhazip.com returns just the IP address in plain-text with no filler, which means I don't have to do any crazy string parsing (yay!). 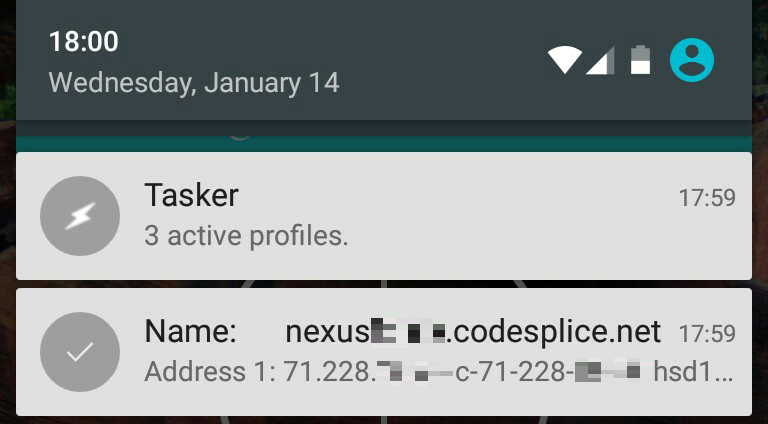 Tasker automatically stores the returned data of an HTTP GET request into the global variable %HTTPD. Only the Server:port field is required. I don't want to run the rest of the task (and submit repeated DynDNS updates) if the current public IP matches what I've already registered. I store the current IP in the%PUB_IP variable. For this If statement, I'm just checking to see if the HTTP GET return does not match the value of %PUB_IP. If TRUE (if it doesn't match), I run the rest of the Task; if FALSE (if it does match), I just skip to the end. Store the public IP as %PUB_IP. This is the heavy lifter. Username and password should be the autogenerated values obtained from Google's Dynamic DNS Synthetic Records Creator Thing - NOT your Google credentials (pls). Replace nexusXXXXX.codesplice.net with your DynDNS record's subdomain (duh). I'm feeling patient, so let's wait two minutes before we check to see if the DNS change has propagated. Set the local %newline variable to a newline character (carriage return - just press Enter on your Android keyboard). This will come in handy shortly. Split the variable %NSLOOKUP into multiple variables at each newline character. We're really only interested in the last two lines of the nslookup output. Create a low-priority notification to display the name of the DynDNS record (%NSLOOKUP4) and the public-facing IP (%NSLOOKUP5). Clean up some of the variable mess. Ask if you have questions or, better yet, give me some tips on what I can use this for.